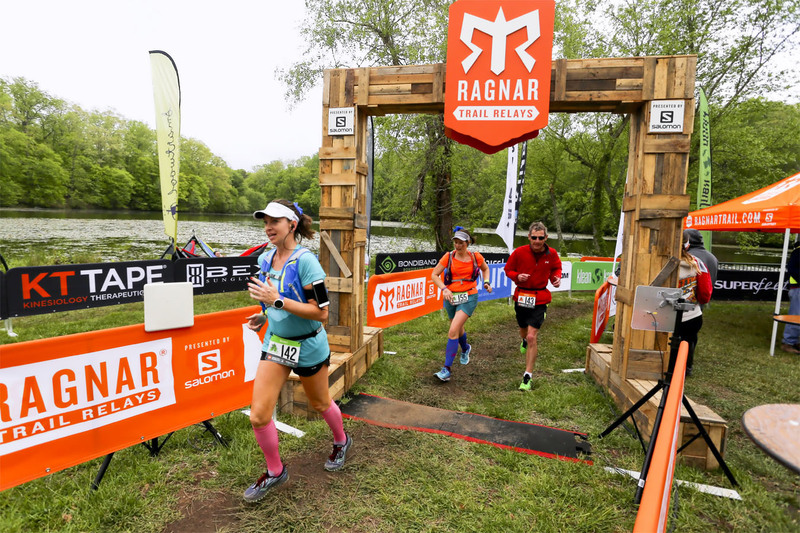 If you’re joining my Ragnar Trail Richmond party late, you can catch up by clicking on Part 1 and Part 2 to read the recaps of my first two legs. 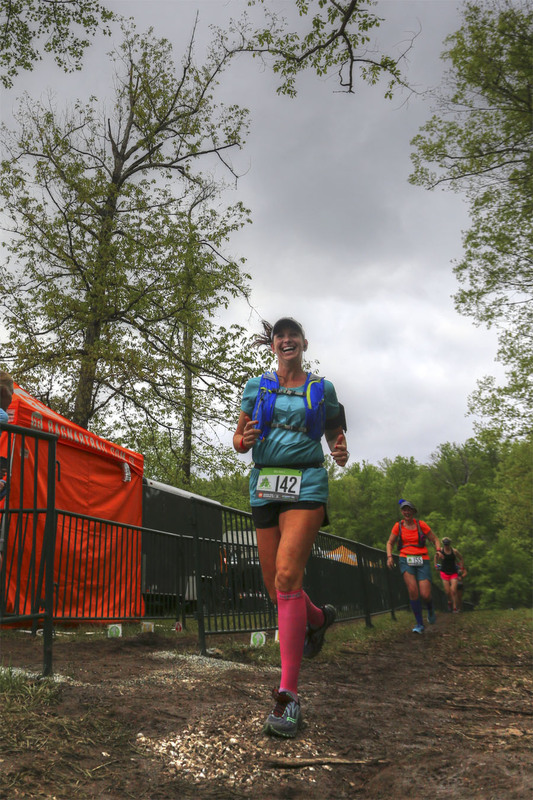 I left off on my previous recap just after Meagan and I discovered that we would be running again in 2.5 hours, almost twice as soon as we had expected, due to the need to double up on some of our loops so our teams would finish the race before the course closed at 6 PM. When we left our campsite to head to the transition area for our final run, all the tents were up, but by the time we returned, it looked like a ghost town. 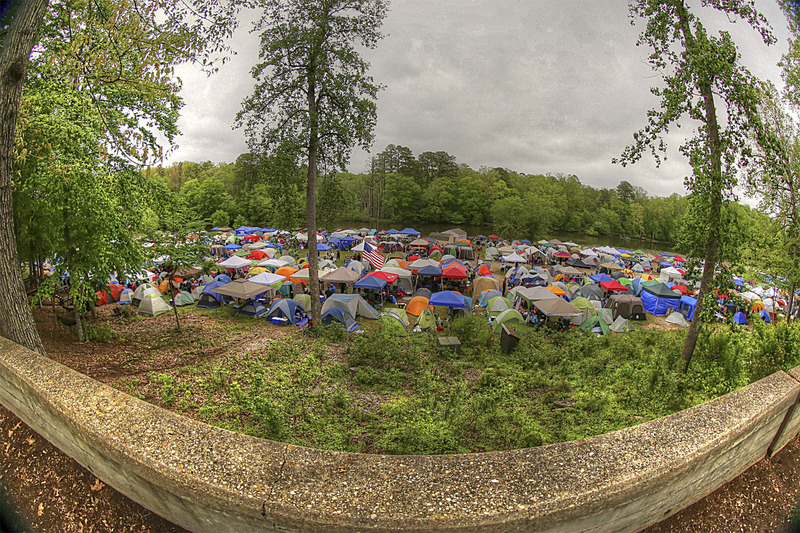 Bill happened to capture this fantastic picture of Ragnar Village with his fish eye lens on Saturday morning. 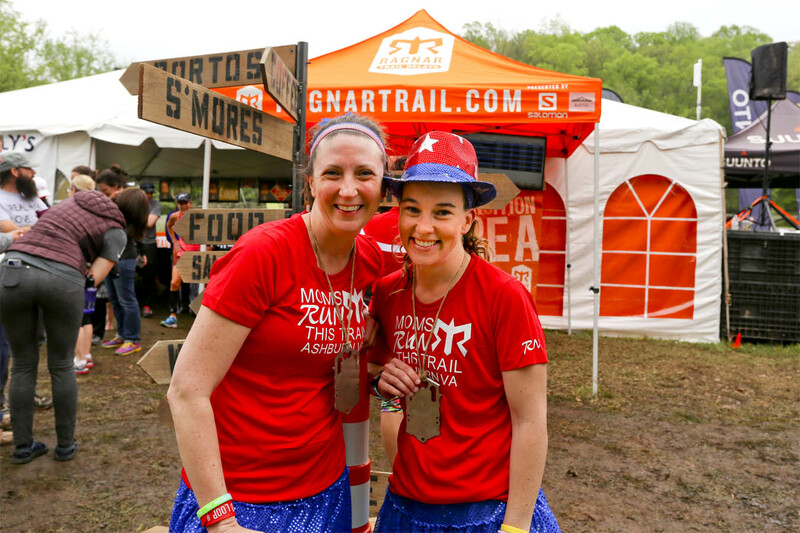 Once closer to the transition area, I ran into my longtime friend Amy who writes at Twingles Mom and was running on a neighboring MRTT’s team. We chatted for a few minutes and then I headed on to watch the boards for our teammates to come in. 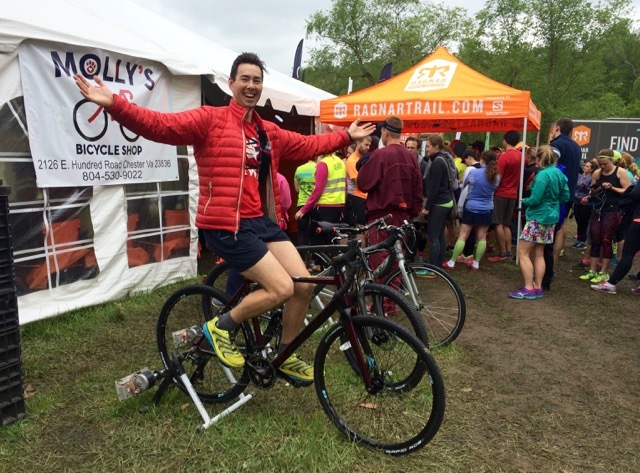 Molly’s Bike Shop (I know because of the sign) had bikes out for runners to warm-up on if we chose. When I asked this guy if he minded if I took his picture, he told me to go for it and even struck this fun pose! 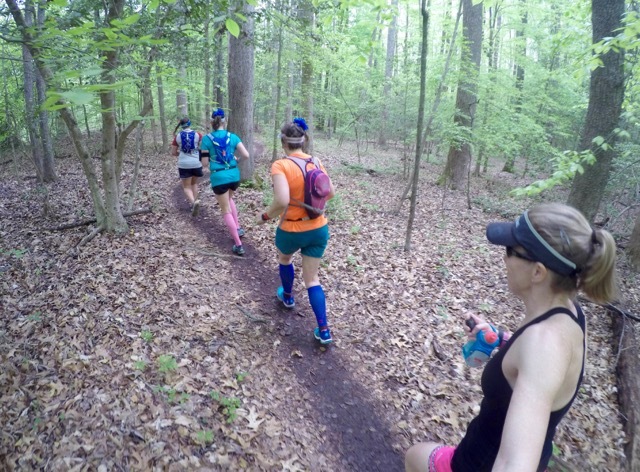 Because we had devised our plan to double up while Jenny and Angela were out on the course, they had no idea that Meagan and I would be joining them for their final loop, and the first loop of our last leg. 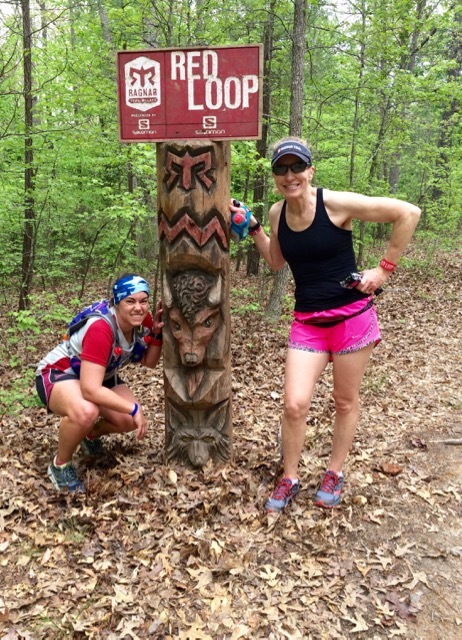 We left the exchange area with Jenny and Angela around 11:15 AM to start our third and final leg made up of the Red Loop (5.5 miles – hardest), immediately followed by the Green Loop (4.4 miles – easiest). Of course by now we knew the miles would be off, and weren’t surprised when our 9.9 miles came to 10.66 miles on our Garmins. Bill had told Meagan and me that he would be stationed just after we left the transition area and if we wanted individual shots to spread out or if we wanted a group picture to stay together as we ran past him. We relayed the message to Jenny and Angela and opted to spread out for our own pictures. 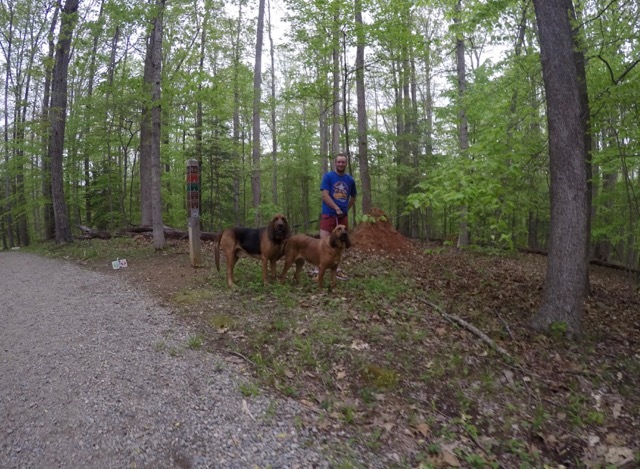 Shortly after heading out we ran past Barry, Hank, and Scout. Meagan didn’t say a word and somehow neither bloodhound picked up her scent so they didn’t realize she was running by. On our first loop, they recognized her and we could hear them crying until we ran out of earshot. 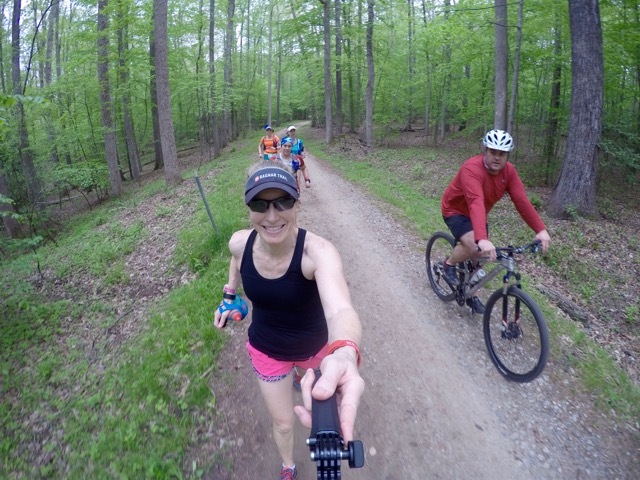 We continued on our run while I tried to capture pictures of the various types of trail that we ran on. And occasionally we stopped for selfies. 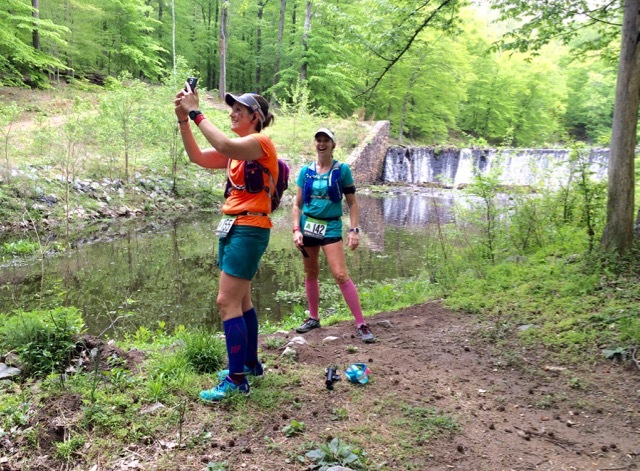 Jenny had just put her phone down, but originally, Angela took a selfie of Jenny taking a selfie with the waterfalls in the background. When we got to the Red Loop totem pole, Meagan and I struck a pose. 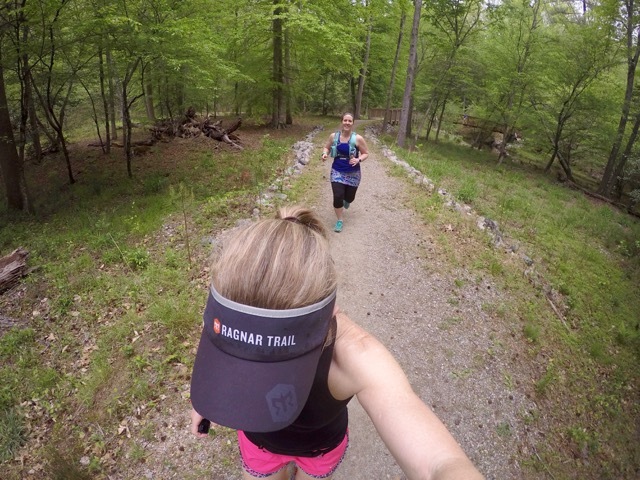 Meagan later posted this picture to Instagram which Ragnar then posted as one of the 35 Photos That Show The Ragnar Trail Richmond Experience. They also used the picture Bill took of me running solo (five pictures up) as one of the 35 pictures. Cool, huh? 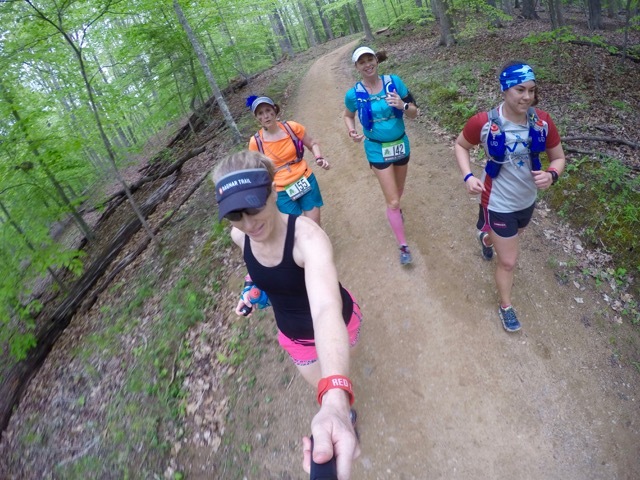 Most of our running was on single lane dirt trails like we’re running on in this picture. On my first attempt to take this picture, a voice behind me said, your GoPro is pointing straight down. The voice belonged to Adam and he hung with us for several miles chatting endlessly and making the miles pass by more quickly. In the end, he couldn’t keep up with us and we lost him. When we met this gentleman riding his bike, he pulled over to the side and encouraged us along. 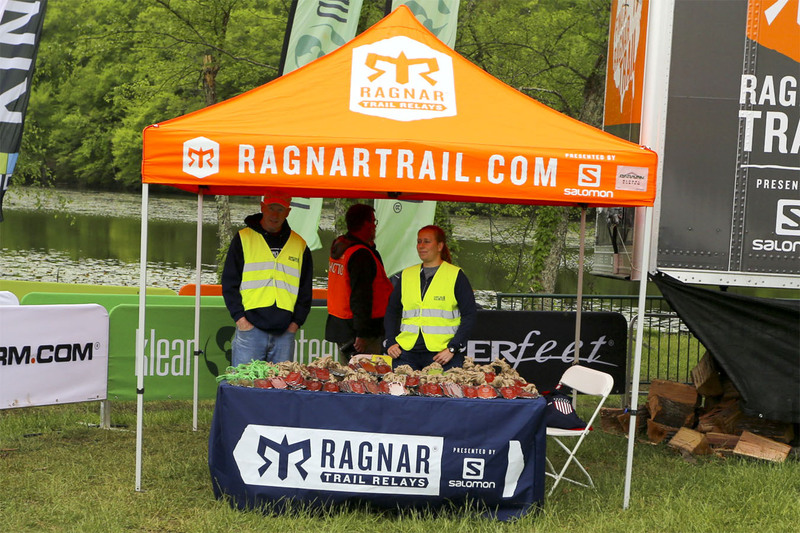 I think on a normal weekend there are lots of bikers on the trails, but because of the Ragnar event, fewer were out. Back on a wider trail, another biker came upon us. When I saw him approaching I pulled out my GoPro for this capture. I wonder what he’s thinking as he looks over toward my camera! 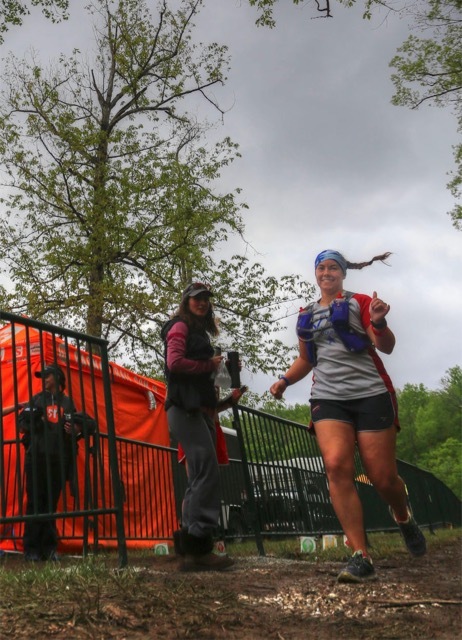 After dropping Jenny and Angela off in the transition tent and congratulating them on completing all three of their legs, Meagan and I picked up Amanda and Kim for our final loop and their first loop of their final leg. Early on in the Green Loop there’s a pretty steep climb that we all agreed to walk. I think my absolute favorite picture of the entire weekend was captured by Meagan’s dad Roger when I let him know what I thought of him taking a picture of me walking! Back on flatter ground, I pulled out my GoPro a little too late to take this picture of the beautiful bridge in the background, but captured this great picture of Amanda! By some miracle earlier in the morning when Meagan and I ran the Green Loop in the dark and I caught my foot under this huge root, I managed not to hit the ground when I tripped and was thrown forward about ten feet! We decided to reenact the trip as we ran past it in the daylight! Back on another really cool boardwalk through a low lying area, I pulled out my GoPro for another picture. 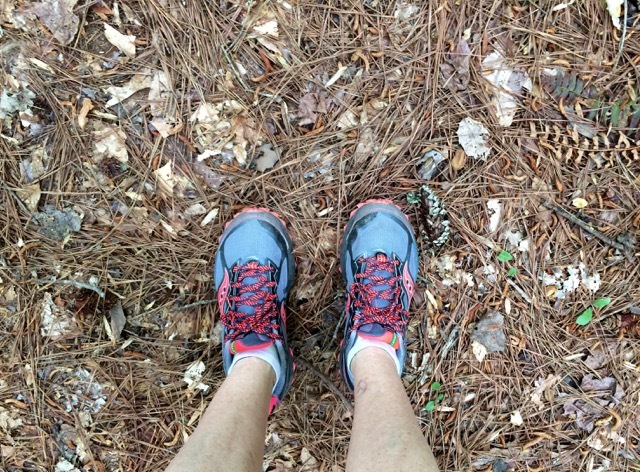 When I first heard about Ragnar Trail coming to Richmond’s Pocahontas State Park, I envisioned all of the trails to be flat and covered with soft pine needles like this. 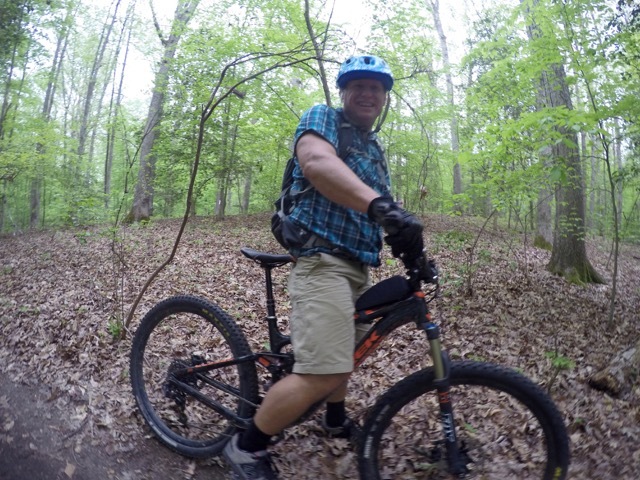 In reality, there were very few pine needle covered trails! 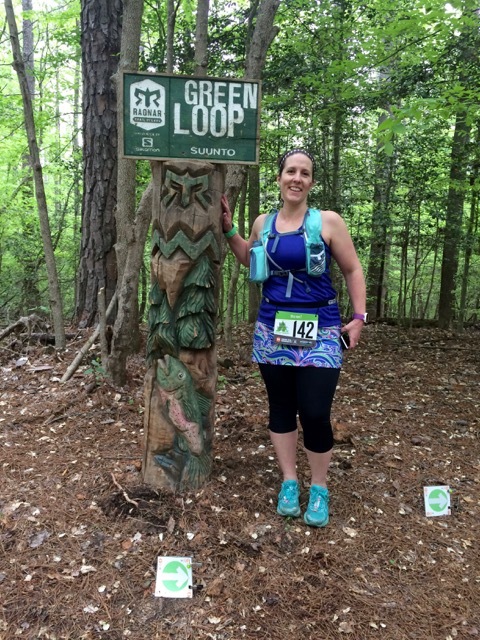 And in keeping with our “stop at all totem poles for a picture” plan, I snapped this picture of Amanda with the Green Loop sign. 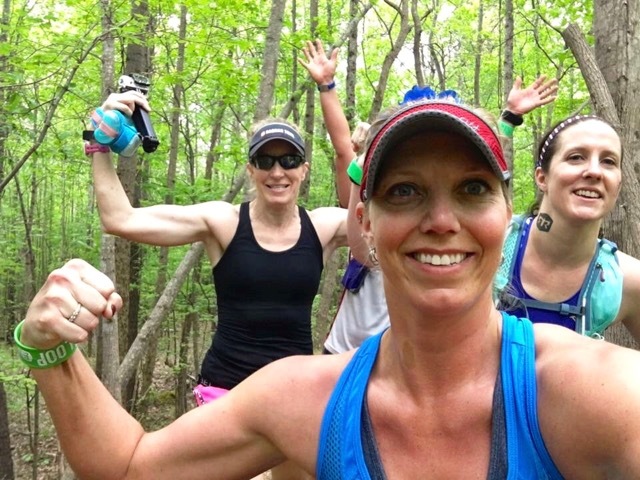 At some point, we decided that we needed a muscle selfie. With Meagan hiding behind Kim, this became the only picture that we got of just the three of us ladies also representing the Cruisers – Kim, Amanda, and me. I can’t believe that we didn’t think of it at any point over the weekend! 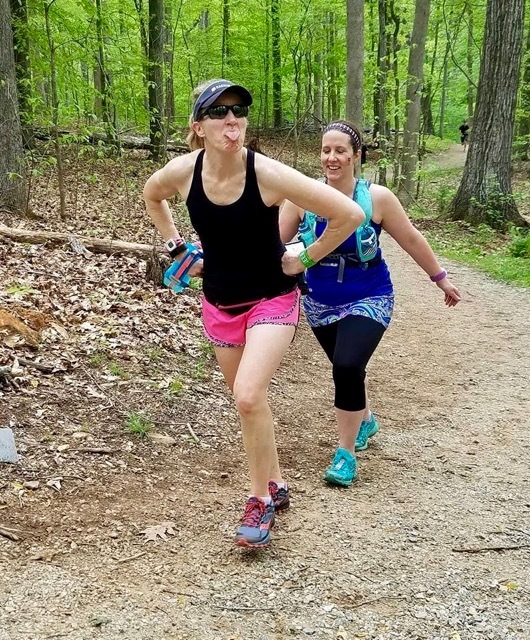 Erin, also a Cruiser, was on one of the regular teams so in reality we had four MRTT runners who are also Cruisers on our team. And finally, Meagan and I came upon this sign – possibly the best sign we saw all weekend! 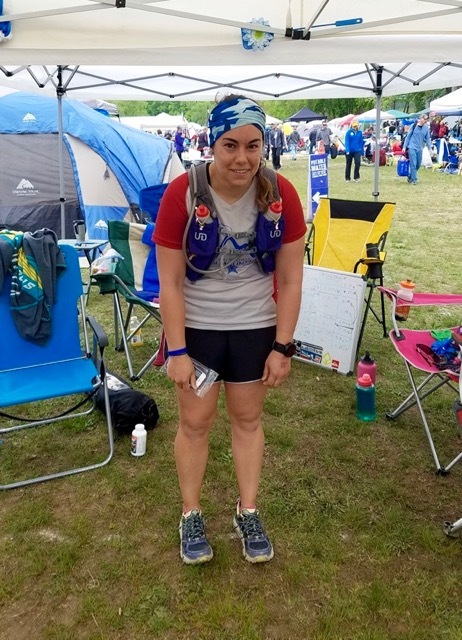 Most impressive about this picture is that we were able to squat down like that after already running about 33.5 miles in less than twenty hours. 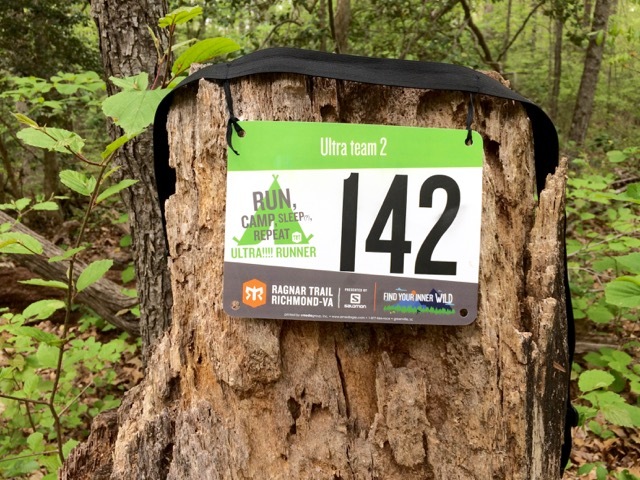 And so we wouldn’t forget later, Amanda and I hung our team’s bib on a rotten tree trunk for a quick picture. 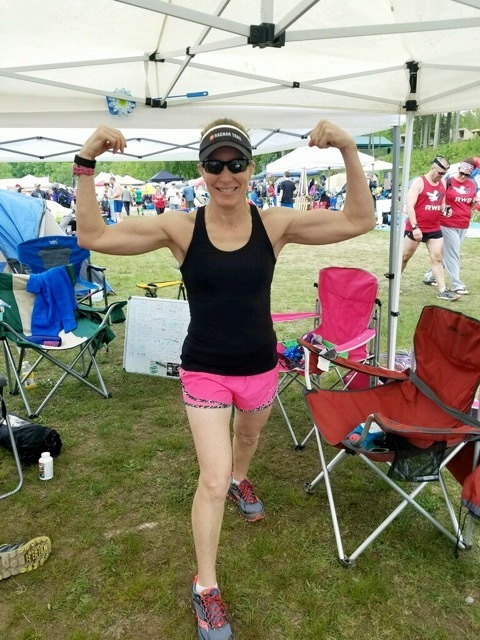 Once finished, I struck my strongest pose, and told my teammates that this is what it looks like to be 58 years old and to have just run 34.42 miles in less than 20 hours! 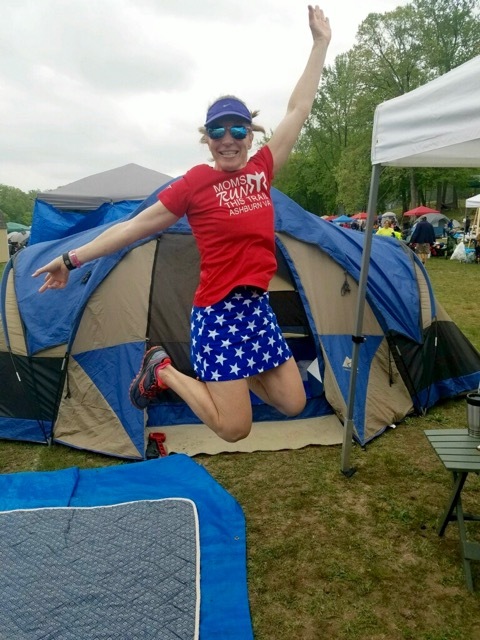 Known to my running friends as a sparkle skirt abstainer, I decided to meet them half way and purchase this fun stars and stripes skirt just for our post-race pictures (the shorts underneath have one leg in this fabric and the other leg in red and white striped fabric). My sunglasses are also very patriotic with red, white, and blue stars and strips on the frames and blue lenses! 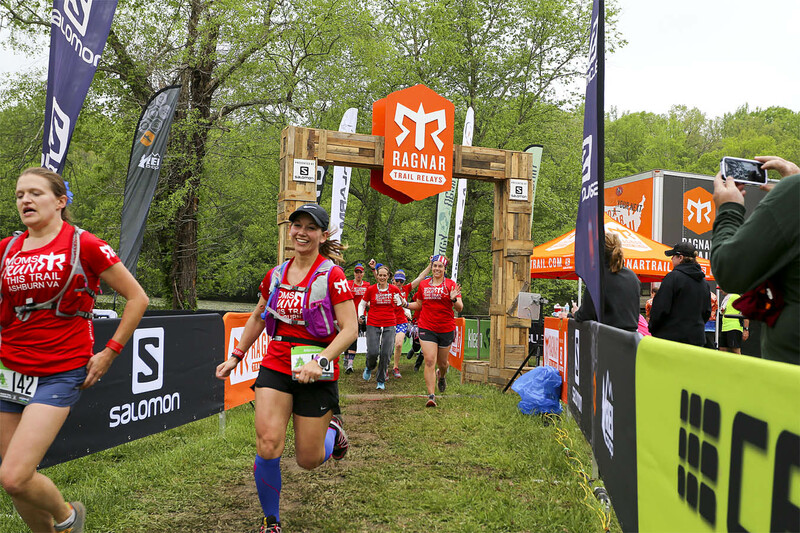 Shortly before we expected Sarah and Ashley to complete their final legs for our ultra teams, we headed up toward the transition area to wait and run with them to the finish line. We got there as our regular teams were finishing up, but about thirty seconds too late for Bill to take their team picture. Most had other plans and took off for home before our ultra teams finished so we didn’t get a big group picture of all four of our teams as we’d hoped. What I’d really wanted was a jump picture of all twenty-four team members in our matching red shirts and patriotic accessories! Wouldn’t that have been fantastic? 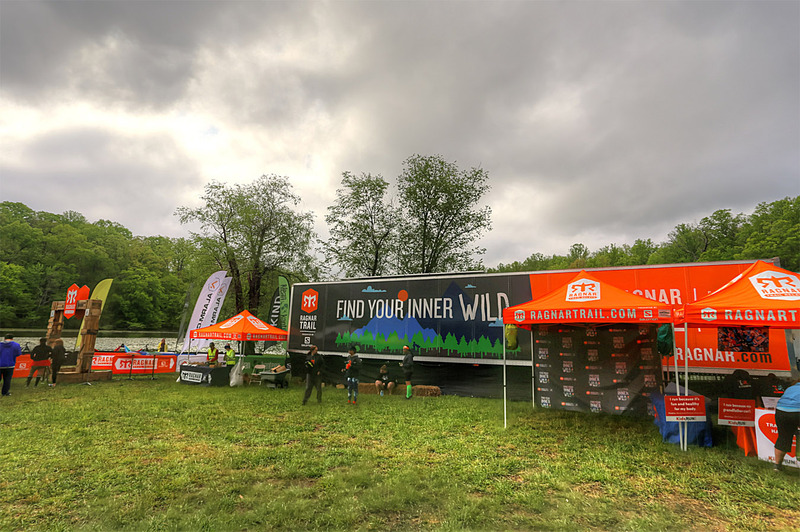 While waiting for our ultra teams to finish, Bill wondered around the finish area snapping pictures with a bit more of an artistic flare than my usual shots. The sky was very cooperative! 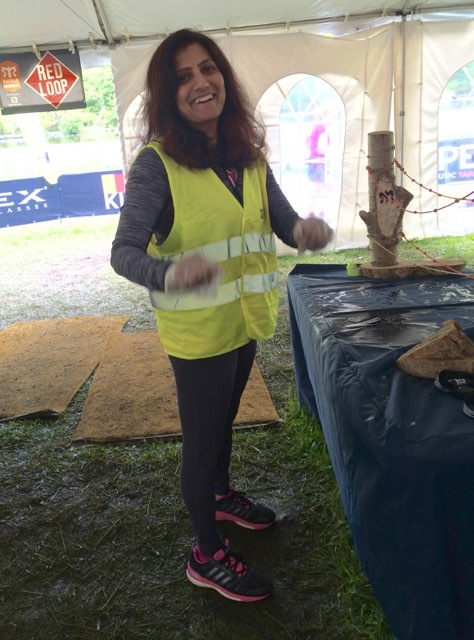 That’s Dee, our team volunteer, inside the tent getting ready to hand a slap bracelet to the next runner. And here is Dee up close! 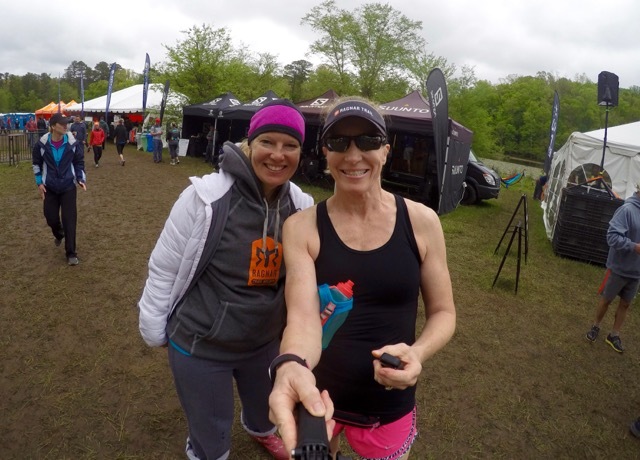 You might remember Dee from my 2015 Ragnar DC recap when she graciously volunteered to be our van driver. 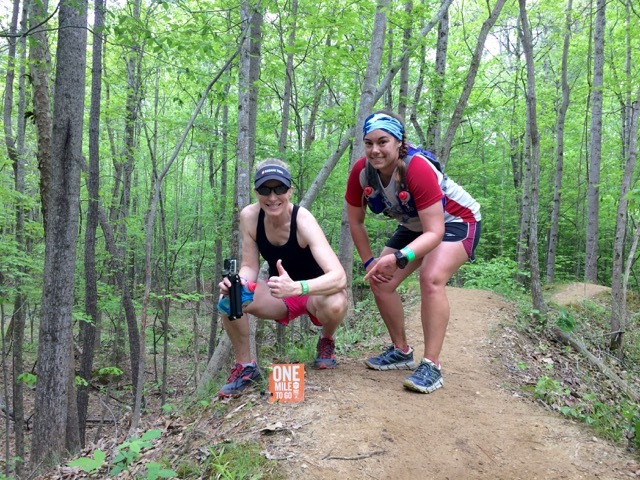 Erin and Melissa, running buddies on our regular teams, stuck around to cheer our ultra teams in; and while waiting Bill snapped this great picture of the two of them. 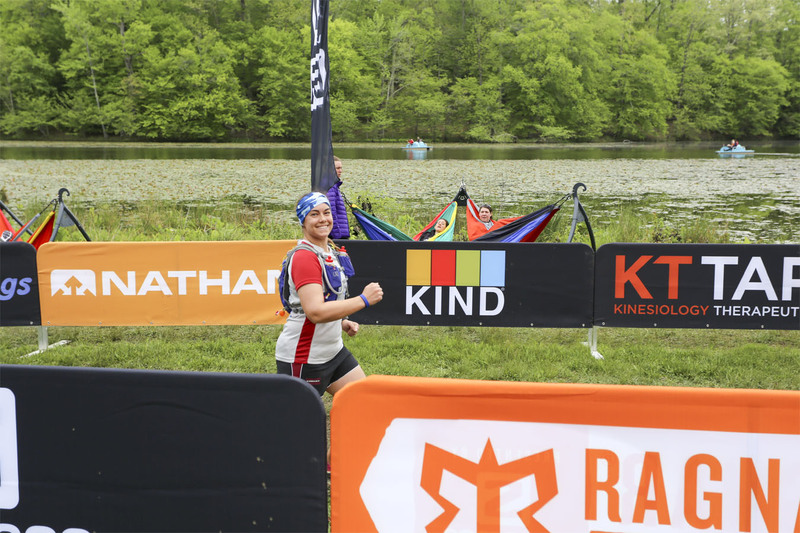 Soon we saw Sarah and Ashley heading toward us, and the rest of the ultra teammates jumped onto the course behind them to let them lead us across the finish line! Bill stepped into the transition tent to snap this quick picture so we could get out of the way before another runner came in. Back outside the tent we were all smiles and a bit emotional after stepping outside our comfort zones and completing an ultra relay. Our team captain and chapter leader Amanda presented us each with our medals and then we joined forces in presenting Amanda her medal! And because we hadn’t gotten but a couple of pictures of us together during our many miles running side-by-side, Meagan and I had Bill take this picture of us with huge smiles on our faces! 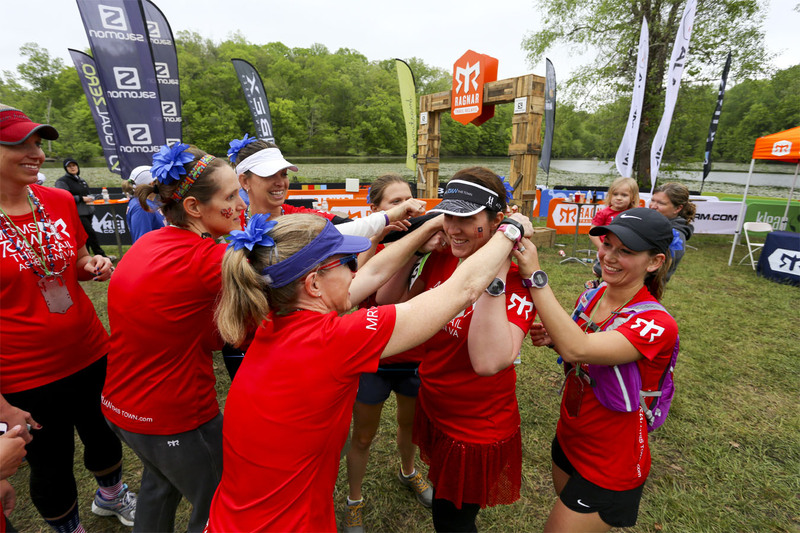 While the official Ragnar photographer had us pose for our post-race team pictures, Bill snapped this one of us. 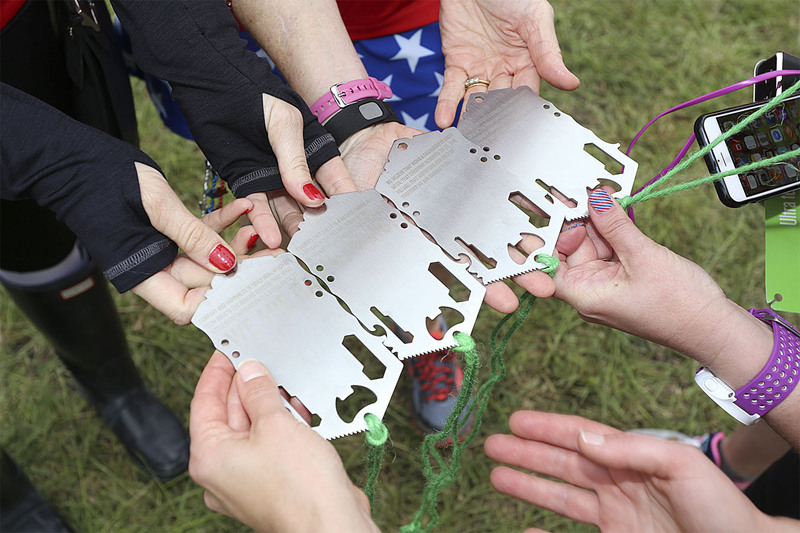 And then our team turned our medals upside down for the message on the back. 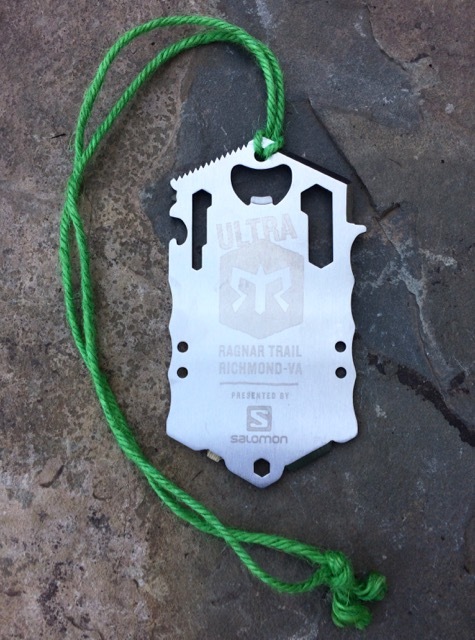 Edited note: Our ultra team (Amanda, Sarah, Jenny, and I) won first place in the Women’s Submasters Division and we received our belt buckle awards in the mail about a month after the event. 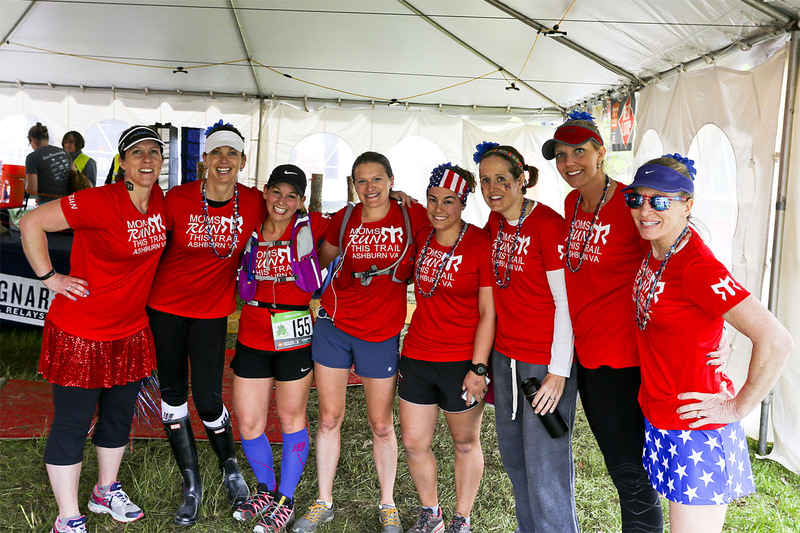 The other ultra team (Angela, Meagan, Kim, and Ashley) placed second in the Women’s Open Division. 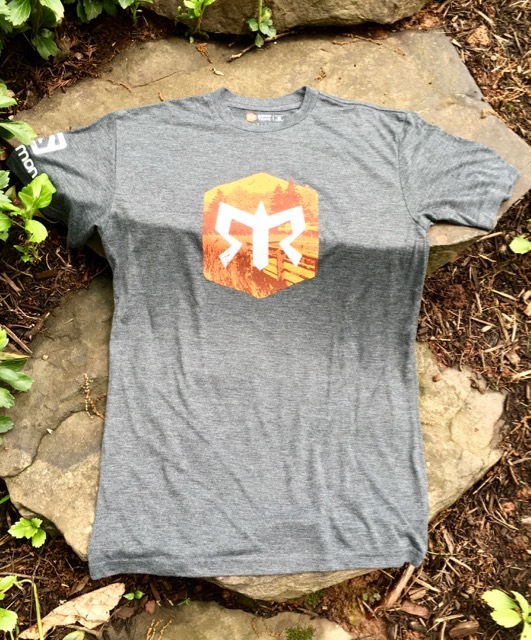 Even though the race shirt is a rather boring gray, it’s cute and made out of fabric that is fabulously soft. 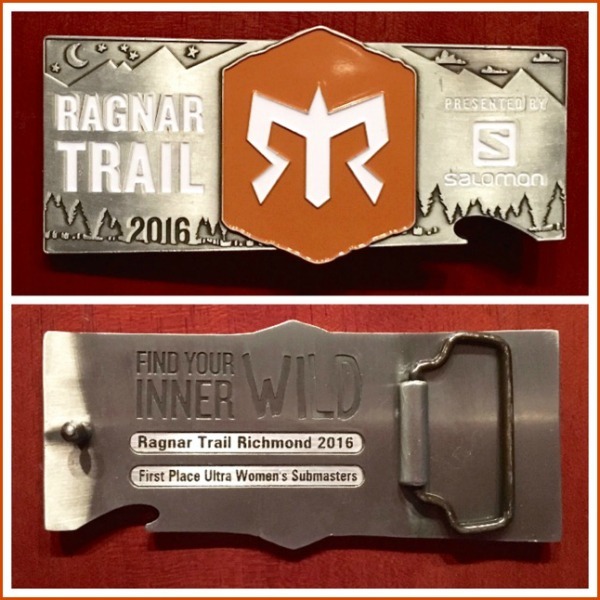 Thanks for joining me on my Ragnar Trail Richmond adventure! It was definitely one of those weekends that was a lot of fun, but I was happy to have behind me. And, yes, I was on a huge runner’s high for days! Do you wear sparkle skirts? 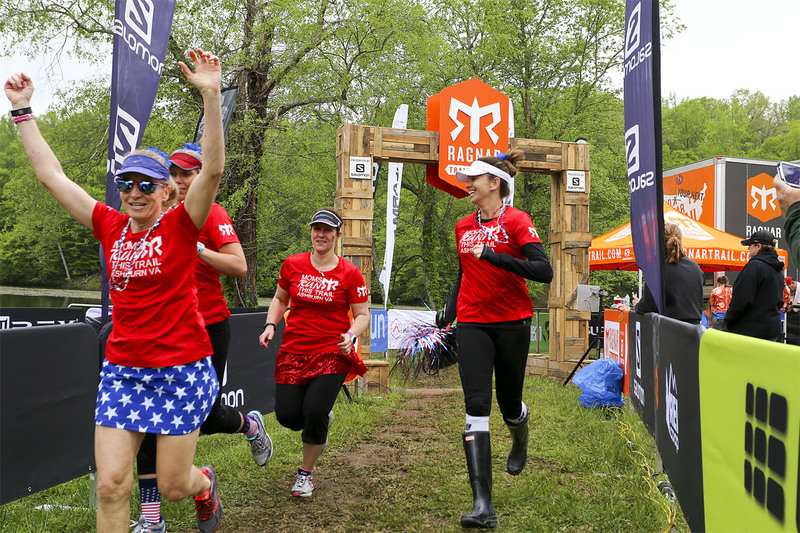 Have you ever run a Ragnar Relay or Ragnar Trail or similar race? 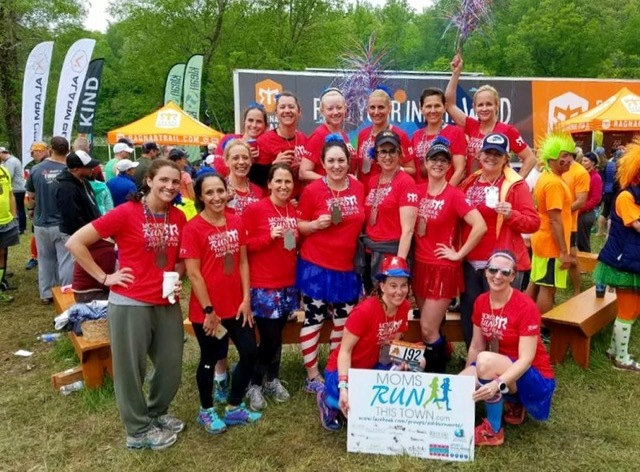 OK, now you’ve given me something else to add to my bucket list: “Run a Ragnar relay,” I have a friend here in our Fredericksburg MRTT group who has run a few of them and she’s been trying to talk me into doing one. I just might one day. 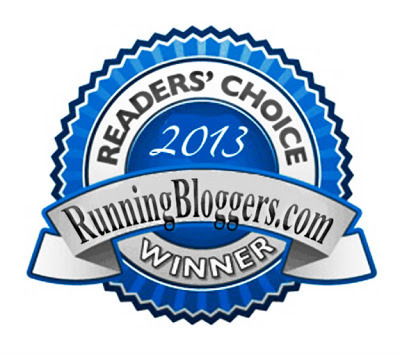 Thanks so much for this inspiring blog! 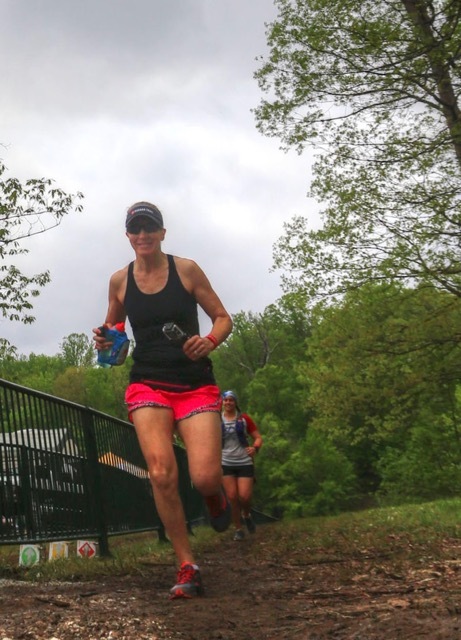 I’m in my late 40s, and I’ve only been running for about three years. 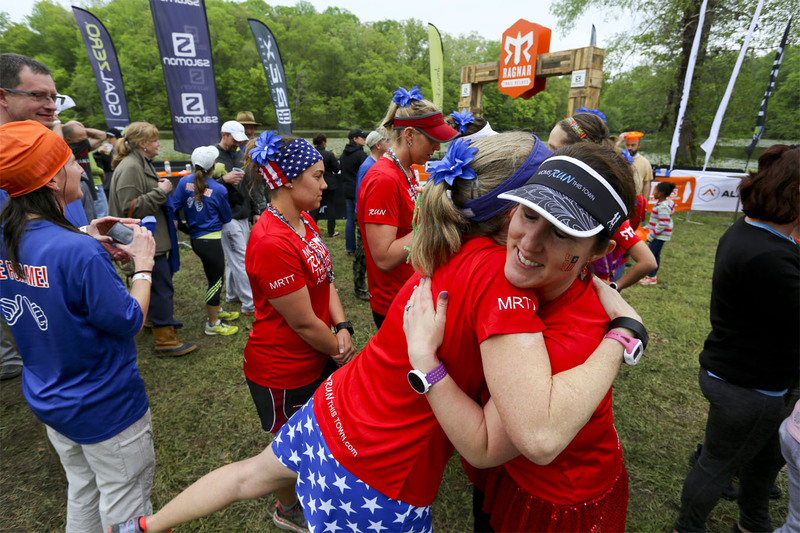 Seeing all the fun stuff you’re doing with running and MRTT just reinforces my desire and motivation to keep running and pushing my limits and trying new things!! Thank you so much for your sweet note, Sharon! 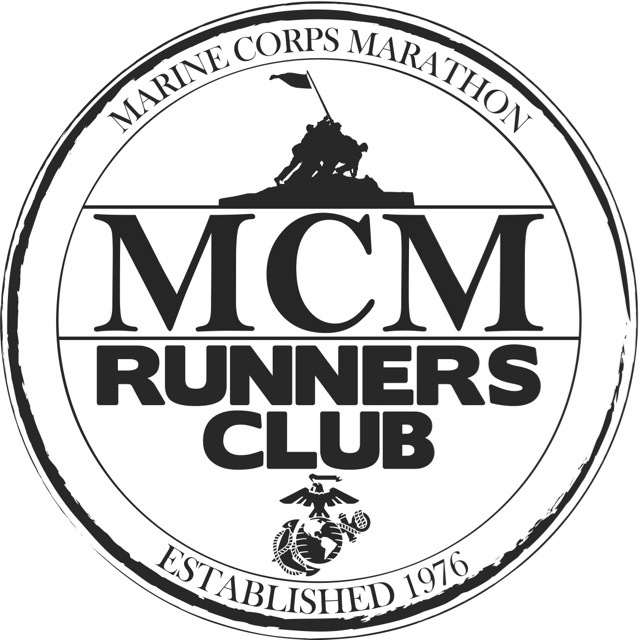 I am not running the Historic Half tomorrow. I’ve never run that race, but have some friends who have. If you’re running it, good luck! I have the Chicago Spring Half next weekend! Sounds tough, but fun! Funny contrasting pics of you and Meagan! Bill takes great pics! 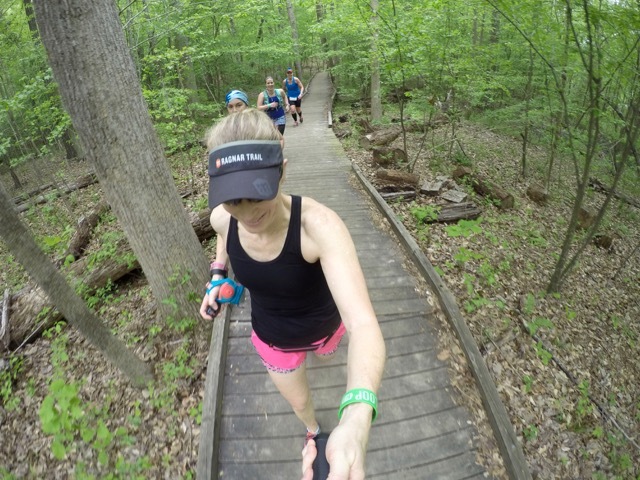 Tina@GottaRunNow recently posted…Two 15 Mile Runs This Week! 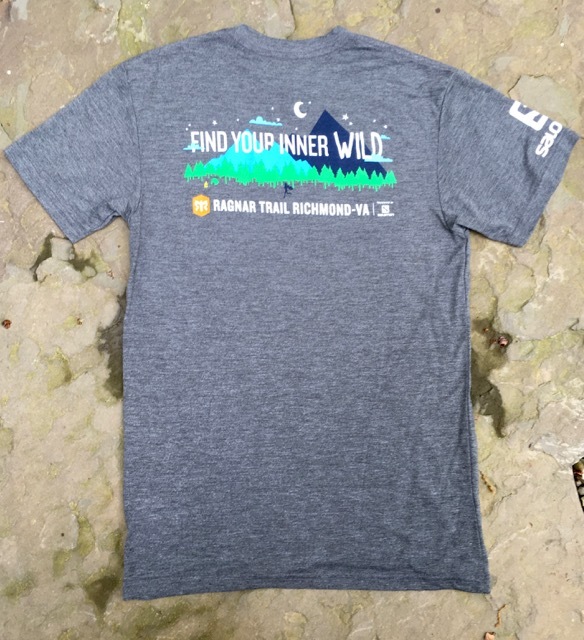 I just recently signed up to run my very first ever Ragnar trail along the Alafia River in Florida. 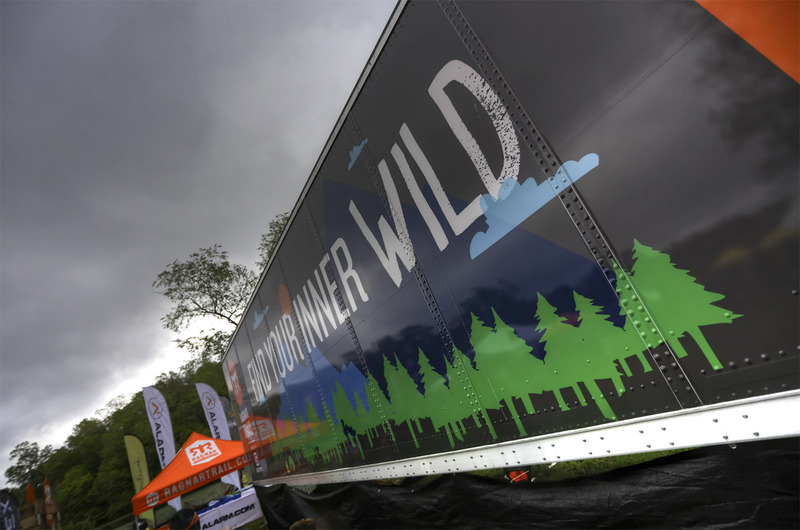 I’m super excited because I’ve wanted to do a Ragnar for a REALLY long time, but nervous because we’ll be running and sleeping in the wilderness at night! Sounds fun! When I ran in the mountains of West Virginia at last summer’s Ragnar Trail, I worried about bears and bobcats during my overnight runs; in Florida I’d be concerned about alligators. Will you even be near the water where they’d be a concern? You are AMAZING and inspire me every day! 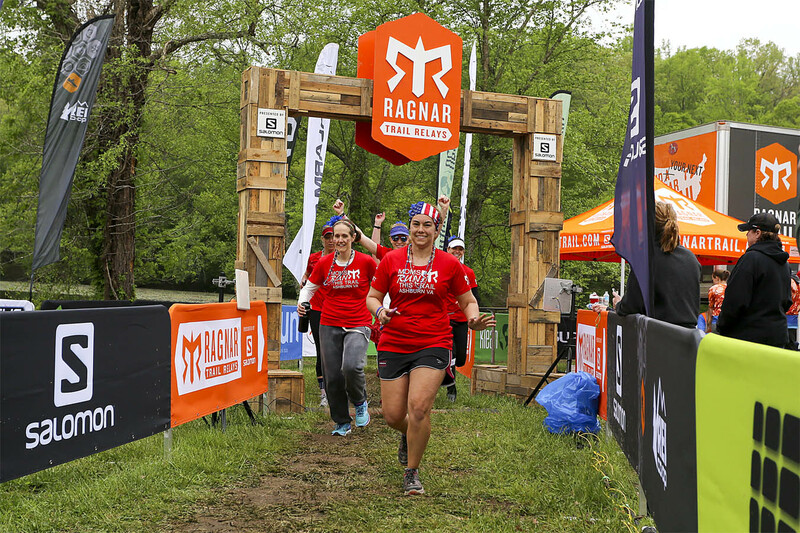 Let me say this one more time….”I want to do a Ragnar!” (whew…that’s better). 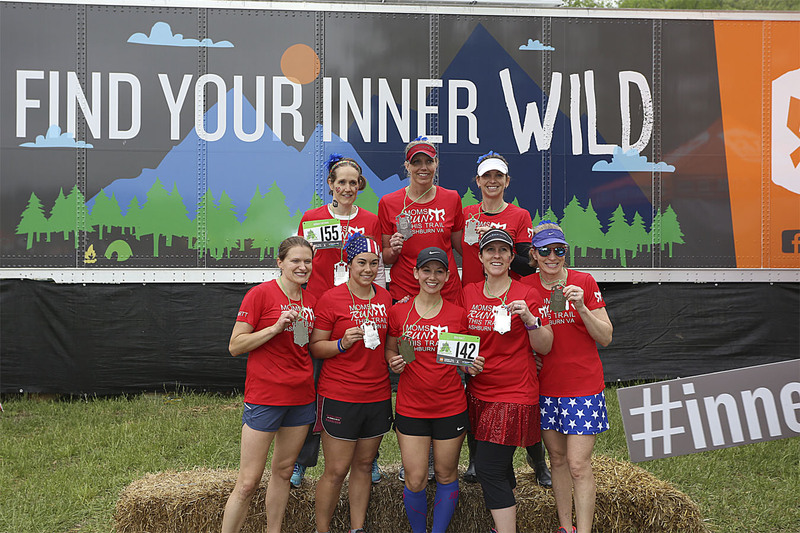 This looks like such a great time, so many great runner friends and your pics are awesome! Do it! Do it! Do it! Yes, we had a blast, and thank you! 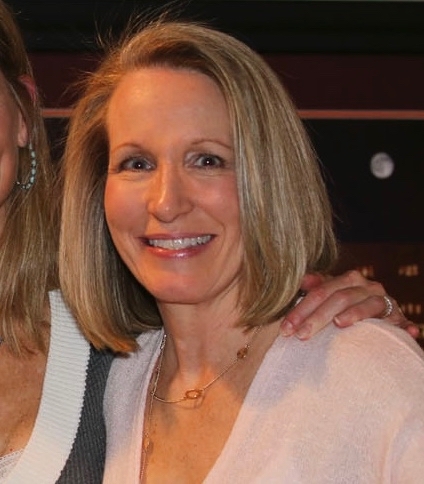 58 is looking great on you! 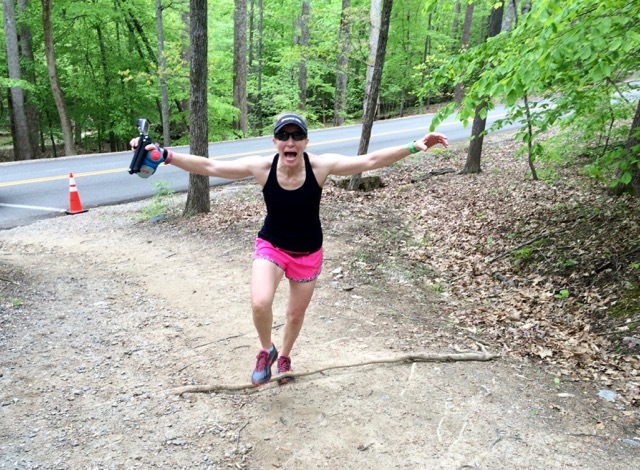 I love your after run shots lol – Meagan is funny! She is so flipping cute. The pictures are all so fun! 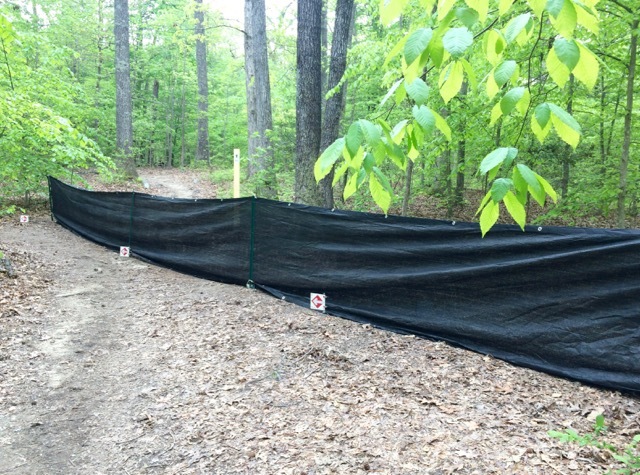 I feel like the rangers did some good trail clearing before the event…some of trails were pretty coated a month ago. Per usual, there are so many details that I completely forgot about! They’re things I know happened (like Bill giving us instructions to spread out for individual photos), but couldn’t remember until you wrote about them. Sleep deprivation is detrimental to my memory 🙂 I love that photo you got of the four of us running the red loop and that one dad took of you! Too funny. 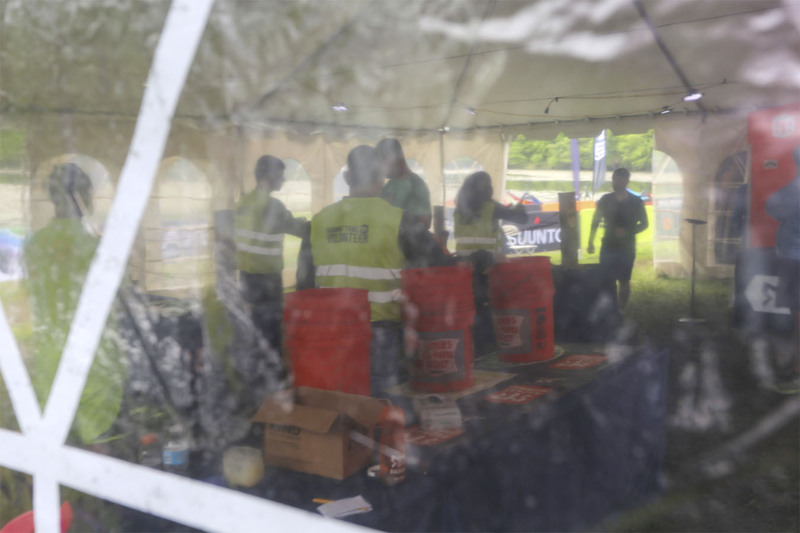 I also really like that one Bill took of our teams inside the transition tent. It seems more spontaneous and less posed, and I feel like everyone just looks so genuinely happy in it. I also like how you credited that totem pole photo on the red loop to my phone 🙂 I think I credited it to you on my blog, though. I’m pretty sure you texted it to me…. didn’t Angela or Jenny originally take it with your phone?? I just love all the smiles! 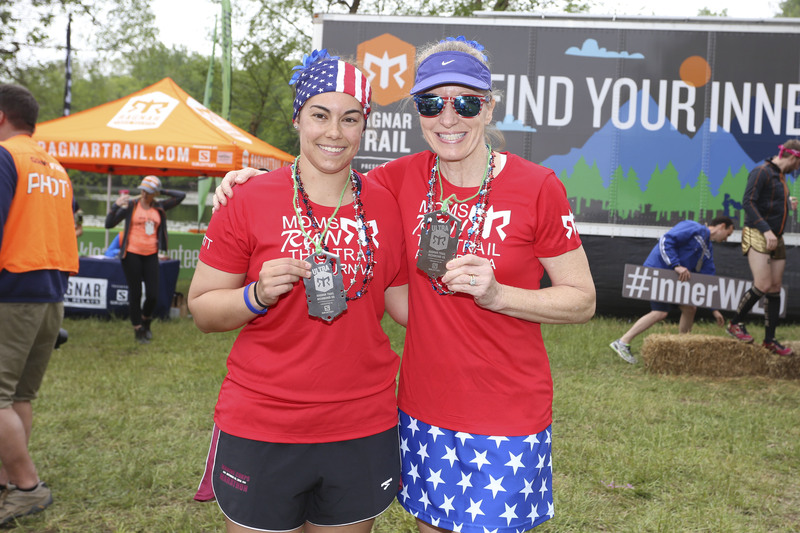 What a tough race and yall as still smiling and having a great time! See that is exactly what attracts me to a Ragnar! 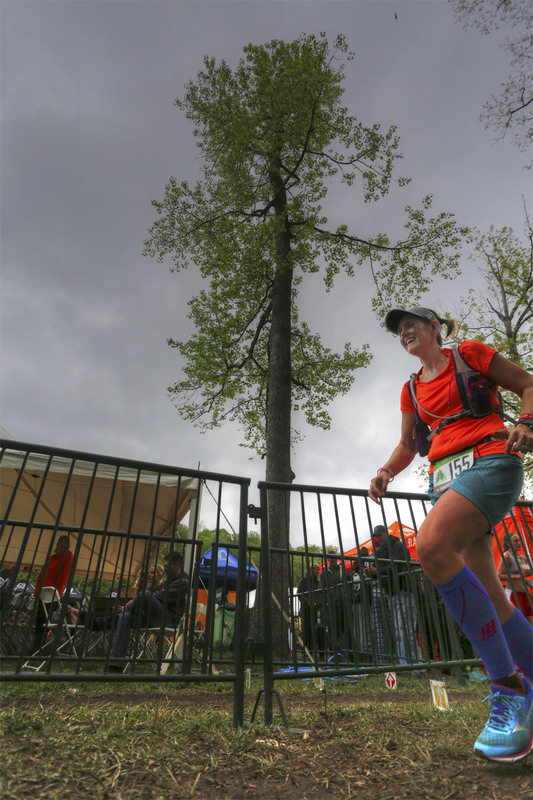 I admit I had to jump on over here and see you in the running skirt, which looks awesome by the way! I love the picture of Meagan too after the race and the pose she’s making! How awesome to find YOU had run this when I googled for information! We’re thinking of doing a team (regular!) for it and I found Meagan’s report with a picture of you and her! 🙂 I was worried it may be too challenging with my knees, but it looks manageable. Thanks for this great resource of information! So cool, Cheryl! 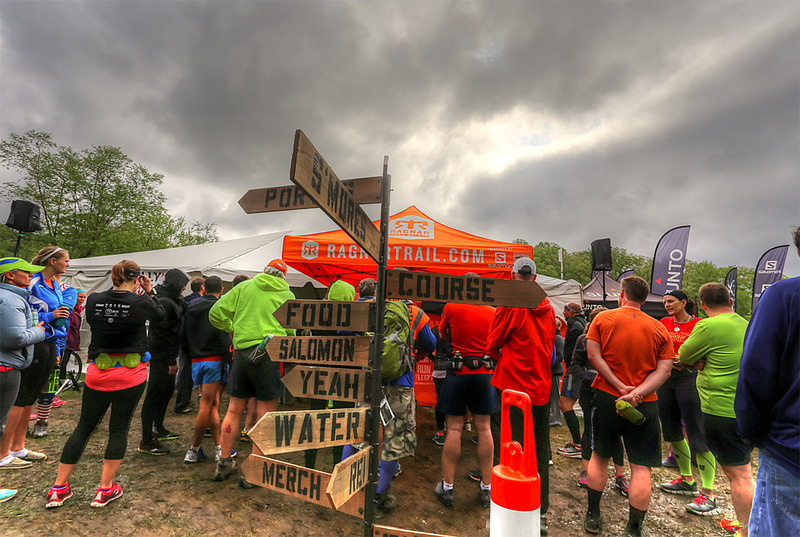 Ragnar Trail Richmond is a great experience and the trails aren’t too technical. We had a blast!